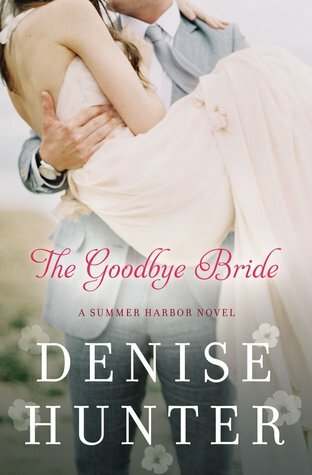 Book Review - "The Goodbye Bride"
Denise Hunter has been one of my favorite authors for years and I can easily stay up reading way later than I should just because once I start reading her books I cannot stop! "The Goodbye Bride" was no exception! This is a Summer Harbor Novel and a return to the lives of the Callahan boys, specifically Zac this time. Zac had his heart broken by Lucy when he returned home after a weekend away to find her gone, her apartment emptied, no note, no nothing, just wedding plans he had to cancel on his own. Now seven months later, Zac is unable to pretend he doesn't care when Lucy is in trouble, and confused, when she wakes up on the restroom floor in a diner in a town she doesn't remember moving to, and in a wedding dress she knows nothing about. Zac is determined to help Lucy figure out who she was supposedly marrying and to help her return to the life she chose over him; however he was not counting on her dragging him and his heart back into her life. I loved Zac and Lucy's story! Zac is such a gentleman and also so impulsive and has such a kind, big heart that it is impossible for him to turn away from Lucy, even though that what others seem to be doing and expect of him. It is impossible not to love Lucy, as she will draw you in with her well-meaning, but klutzy actions. I love Summer Harbor and how loyal the townspeople are and how quick they are to defend their own and also how quick they are to forgive as well. I highly recommend this book, it is one you do not want to miss! Book Review - "Change of Heart"
Courtney Walsh has become one of my must-read authors. I adore her books, the stories and the covers both! "Change of Heart" is an emotional read, very heart-wrenching at times, but also so hopeful and full of life and love. Evie has been unhappy, unhappy in her marriage and the direction life has lead her in general. When her world is shattered, and continues to unravel, she seeks solace and with the help of some friends slowly finds her footing and sets on a path of healing and hope. I absolutely loved this book! It was such a sweet romance, but not unrealistic as the characters are facing tough things and life is not perfect. Evie and Whit are perfect examples of that, and yet they are also examples of true love and hope and healing. This is a book that will touch you deeply and leave you feeling satisfied but also wanting more. I am looking forward to what Courtney will write next. 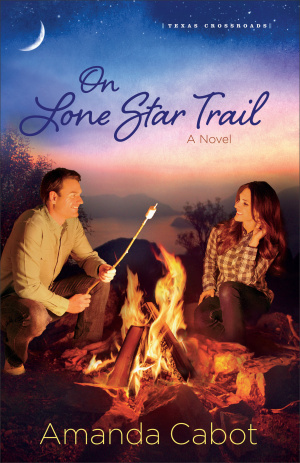 "On Lone Star Trail" is Amanda Cabot's latest Texas Crossroads novel and I loved being back at Rainbow's End Resort and back in this town with the characters from her previous novels in this series. Gillian has been Kate's best friend for years and really felt more like a part of her family growing up than in her own at times. Gillian has returned to Rainbow's End to spend time with Kate and to also take a break from reality and trying to figure out what she is going to do with her life as life as she has known for years is over. Gillian was not counting on befriending a man, much less a man who rides a motorcycle. T.J. was not planning to stay in this little town, much less at a Christian resort as he has one purpose, finish Deb's bucket list. However, as T.J. and Gillian's paths cross and they find themselves at Rainbow's End, they find themselves enjoying each other's company and also find themselves following their hearts in projects, feeling happier than they have felt in awhile. I really enjoyed this story and spending this time with T.J, Gillian and the other characters whom I loved in the previous 2 books in this series. T.J. and Gillian both have healing to do in their lives and Rainbow's End seems to be the perfect place for them, along with a few nudges from Greg and Kate as they work with the teens in Firefly Valley and become involved in town. This and adding in another love interest for Gillian definitely adds a little spice to the story and kept me turning pages as fast as I could! I highly recommend this book, but be sure to read the other books in this series as well as their stories tie in and build in each novel. Whether next door or in the next time zone, our friends are some of our most vital relationships. We cherish time spent together and look forward to the next time we can solve the world's problems over coffee. There is something about a true friend that no other relationship can touch. Collecting over fifty true stories from some of today's best writers, Dawn Camp offers you a chance to sit back and experience the gift of friendship. With its beautiful photographs and poignant prose, this collection is the perfect pick-me-up anytime you need a boost. 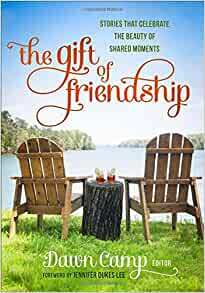 "The Gift of Friendship" is a great collection of stories focusing on friendship. Life is so busy in general with work, family, just everyday responsibilities in life that it is so easy to all of a sudden find yourself not having friends or more likely not being a good friend. This book celebrates friendships, but also recognizing that friendships can be hard to maintain, but yet they are something that are so important. There are several sections to this book; my personal favorite is pursuing friendship and also the hospitality one. Throughout life, friends and friendships change based upon our roles and lifestyle as a child to college student to working to being a mom. I really enjoyed this book as I found myself relating to many of the stories. Also, the layout is very visually pleasing with pictures interspersed and the layout of the pages. I highly recommend this for all women to read, no matter where they are at in life as friendships are so special and treasured, whether you have "old" friendships or creating new friendship ties. "Roots & Sky: a journey home in four seasons," by Christie Purifoy is a sweet, comforting read that will draw you in and soothe your soul. Christie moves into a home with her family and shares with the reader her first year there. Christie shares her heart, experiences and things she learns in this journey. The chapters in this book are divided into four sections, one section for each season of the year. I liked this as we are all in a different season of our own lives and yet our lifestyle will vary each season due to traditions, and activities and yet these will change year to year as well. This book is filled with beautiful statements and I loved reading through this and I have marked so many passages. One early on that I starred is "Our lives are stories built of small moments. Ordinary experiences. It is too easy to forget that our days are adding up to something astonishing." This is something I try to remind myself often as the days seem to rollover into each other and just an endless list of things that have to be done, instead of focusing on the things that matter. This book will help you remember to do just that. "The Prophetess" by Jill Eileen Smith is Deborah's Story and the second book in the Daughters of the Promised Land series. What I love about Jill's novels is her ability to bring to life the Biblical time period, the physical setting, the style of life and the individuals whom fill the pages of the Bible. "The Prophetess" is no exception as right away I was drawn into the story and the land and Deborah's life. Deborah and her story are so fascinating to me as she was living in an arranged marriage and in general living a life so different from what is norm in today's society. However, she was given such a huge role and such a honor by God and was able to play such an influence in so many lives. At this same time Deborah is still dealing with her past and the horrors that took place and now she is forced out of her comfort zone and follows her heart and head listening to God. I absolutely loved this book, it is an amazing account and evident of the amount of research and study that was put into it. I highly recommend this to anyone whom enjoys historical fiction. I am a fan of Maggie's novels and I was immediately hooked on her latest, "A Sweet Misfortune!" This is book #2 in her Virtues and Vices of the Old West; I love the "rugged" historic setting of the Old West. The story drew me right into the action as John does what he knows he has to do for his buddy, rescue his sister from a saloon and this is does right in midst dance and rides off with her fighting him all the way. Rachel is a fiery, independent woman who is determined to do what it takes in her current situation, although remaining at John's is testing her so much. This story is filled with action, faith and love as John and Rachel find themselves in each other's space and lives. These characters are so much fun and full of life, and the storyline is full of humor, hard times and hope. I highly recommend this book for historical romance fans! Book Review - "Always Watching"
Lynette Eason starts out her brand-new series with a psychiatrist and radio personality whom has a stalker, or maybe more than one, whom is sending him gifts and making it known that she will not stop until she has her way. The Elite Guardians Agency is hired to protect Wade and his daughter Amy; however they find themselves as targets of the threats as well. When Olivia takes over the duty she finds herself being pulled in more than she wants and her defenses going down the more time she spends with Wade. Wade has been raising his daughter since the death of his wife with the help from his sister-in-law and her friend. As things heat up and more and more threats take place, past events are revisited and it seems that Wade no longer knows whom he can trust. Lynette writes exciting, cannot turn the pages fast enough suspenseful stories. I really enjoyed this story and am looking forward to the second book in the series coming out later this year as I am looking forward to spending more time with Olivia, Maddy, Katie, Quinn and Bree, as the ladies team up with the local law enforcement. I love how the characters changed and grew throughout the book including Olivia and Amy. There are so many layers to this story and all of the characters as their lives are intertwined together. I highly recommend this book for anyone whom enjoys romantic suspense. 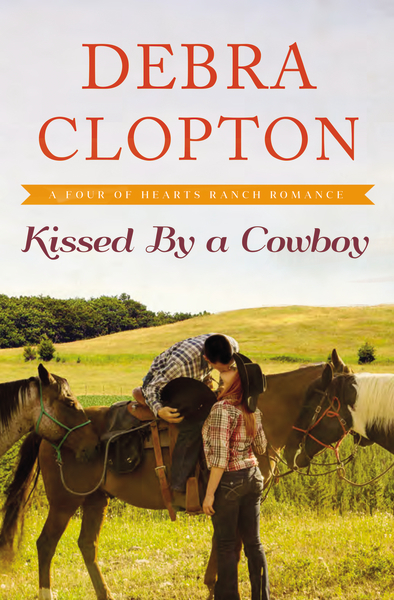 How can rancher Jarrod show Cassidy that a cowboy's kiss lasts forever? Cassidy was looking for a home and a place to belong . . . not for a cowboy to steal her heart. Having lived through her parents' endless string of "matrimonial bliss gone wrong," Cassidy Starr knows when the odds are not in her favor. 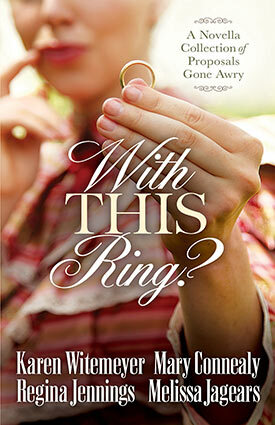 Divorced and humiliated, her faith on rocky ground, Cassidy is through with love. She's been bucked off that horse far too many times. Instead, she returns to Wishing Springs, Texas, and the rundown farm she's inherited from her great aunt Roxie. She'll reopen the strawberry farm and a bed & breakfast and follow in her aunt's footsteps, remaining forever-independent, happy . . . and single. Rancher Jarrod Monahan's hands are full running the ranch, looking after his ailing grandfather, and chasing down a group of rustlers on the loose. He's pushed his longing for a family to the bottom of his list of priorities. Besides, he was in love once but ran scared and lost his shot at happiness. But suddenly, the biggest regret of his life has moved in next door with a wounded heart, determined to become a spinster . . . and that's a challenge that Jarrod can't pass up. Jarrod sets his mind to breaking down the walls around Cassidy's stubborn heart. How can he show her that a cowboy's kiss lasts forever? For the good folks of Wishing Springs, falling in love has never been so much fun to witness. Debra Clopton is a multi-award winning novelist and has written more than 22 novels. Along with writing, Debra helps her husband teach the youth at their local Cowboy Church. Debra's goal is to shine a light toward God while she entertains readers with her words. I loved this return to Wishing Springs with Debra's characters and have so enjoyed this series! Cassidy is done with love and knows it is not in the cards for her. She returns to Wishing Springs, a place where she was happy at one at one time and is determined to live the legacy that was left to her. However, Jarrod was not part of this plan. Jarrod and Cassidy are both stubborn people, each with their own set of baggage, but also missing out on something in their lives, a void that needs to be filled. This is a really fun read and a book that you will not want to stop once you start reading! I was immediately drawn into Cassidy's life and the story as Cassidy returns "home" and is determined not to get emotional, alluding to what is below the surface. Cassidy and Jarrod are both characters whom I enjoyed spending time with and I found myself empathizing with them and cheering for them. Aunt Roxie is a person whom I would have loved to meet from her influence on Cassidy and the role that she played in her life, an amazing person whom Cassidy needed in her life and she continues to remember and draw strength from her memories. I highly recommend this book and this series. To read other reviews included on this blog tour, go here! I loved all five books in Dani Pettrey's Alaskan Courage series and was so excited to read her brand-new book and start to a new series! 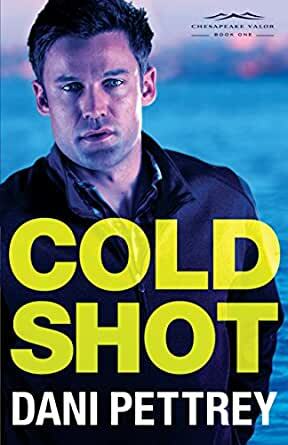 "Cold Shot" is book #1 in Dani's new Chesapeake Valor series and it is an excellent start. The story is fast-moving and there are so many characters and other stories intertwined and alluded to that I cannot wait to see where Dani takes the story in the next book. Griffin is working as a park ranger and finds some men messing with historic burial grounds and Finley is called upon. There is attraction between the two, but that has been overlooked until now as things heat up in every sense. As reinforcements must be called in, Griffin, Declan and Parker are thrown back together to work on this case. These men used to be best friends, but a tragedy pulled them apart and then another friend disappeared. As they work together to find who Jane Doe is and who made the cold shot, their stories and past are revealed more and more and different relationships are formed as they rush to find answers and protect themselves at the same time. I cannot wait to read book #2 and be back with these group of characters again! "Be you. Do Good. : having the guts to pursue what makes you come alive," written by Jonathan David Golden, is such an inspiring read! The title pretty much tells you what is this book is all about, really not holding back toward pursuing your dreams and trying to be who you want to be and all that you can be. Jonathan has such a personal style to his writing that while reading this book it feels as if you are sitting across the table from him chatting over mugs of coffee. The book is very engaging and I like the reflection questions at the end of each chapter that really made me think about my life and where I am at. Even if you think you are where you want to be and do not really have a big dream you may want to pursue, this is still a great, thought-provoking read. TV reporter Erica Sparks has become a superstar overnight. Is it due to her hard work and talent, or is she at the center of a spiraling conspiracy? I have loved Lis Wiehl's previous novel and her latest book she has teamed up with Sebastian Stuart and it is a winner! "The Newsmakers" is hopefully of the first of several novels focusing on reporter Erica Sparks, whom has suddenly risen to fame. Erica overcame a rough childhood and very poor choices that she has made an adult and she has become a celebrity; however it was a result of tragedy and Erica finds herself in trouble and is unsure of whom she can trust. This is such a great and tense read! Erica is chosen to be a reporter for an up and coming network, and she is being groomed to be the star and face of this network; however her digging into stories and following her instinct does not sit well with some individuals. I love Erica as a main character, she is such a strong person yet is trying to cope with her insecurities and vulnerabilities, making her so human and one that can be empathized with. Erica's struggles and her relationship with Dirk, Jenny and even Greg draw the reader even more into her life. I felt as if I were in New York City and jetting across the US with Erica on stories as the writing is so descriptive. I am anxious to read what Lis writes next. The question isn't IF you will get an invitation . . . but will you come? When a water vessel is filled with dirt and stones, it cannot be used to quench a thirst. But, when this vessel is emptied, there is an opportunity to fill it until it overflows with fresh, cool, life-giving water. Water that quenches. Refreshes. Soothes. Our souls are the same: filled with fear, doubt, and disappointment. Running over with unanswered prayers and lingering questions. When we empty the mess of our lives in the presence of God, we're offered an invitation to come. 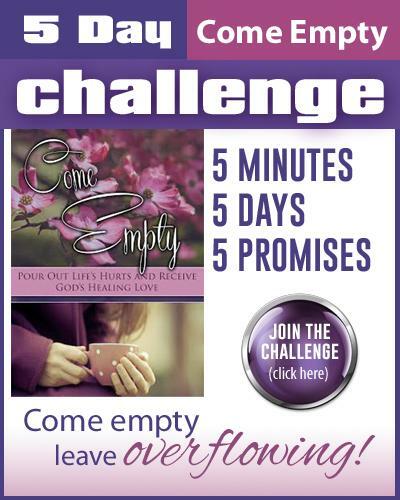 An invitation that allows us to come empty --- so that we can be filled until we overflow. 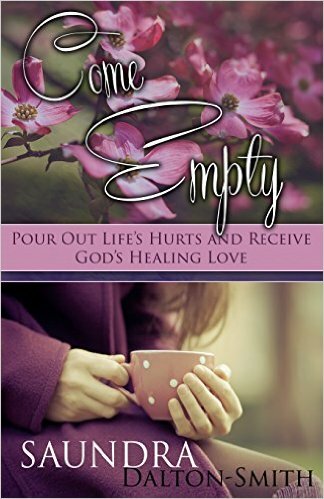 Come Empty: Pour Out Life's Hurts and Receive God's Healing Love guides you through fifty days of experiencing the fullness of God's love and His ability to overcome life's hurts. Each day, you will receive assurance of God's presence in your difficult situations. Each devotion gives new vision and perspective when you're hindered by emotional blind spots, and leads you to experience God's peace and wholeness. When His invitation is accepted, He will set your captive mind and heart free to live fully by His grace. The question is not if you will get an invitation. The question is, will you come? Dr. Saundra Dalton-Smith is a Board Certified internal medicine physician. She shares with audiences nationwide on the topics of eliminating limiting emotions, finding grace in difficult places, and experiencing personal renewal by drawing near to God. Dr. Dalton-Smith is a national and international media resource on the mind, body, spirit connection and has been featured in Women's Day, Redbook, and First For Women magazine. She is the founder of I Choose My Best Life. Her other books include award-winning Set Free to Live Free: Breaking Through the 7 Lies Women Tell Themselves. This is an amazing book that you can personally tailor to fit you, you right now where you are at in your life and what is causing pain in your own personal life. "Come Empty" is a collection of devotions that can be worked through and chosen to fit your journey and will be with you on a 50 day journey toward emptying out your hurts and healing. Pain is an inevitable part of life and everyone experiences pain of varying kinds at varying levels, some visible to other, a lot of pain is unseen though really causing one to feel all alone. The readings are divided into groups, such as identity, relationships with others, positive emotions, to name a few. Each reading is short, but they are deep reads with additional things to help you to dig deeper if wanted/needed. I love how you can personalize this so completely; I highly recommend this book for a personal devotion book. This coloring book begins out as a little story with the coloring pages and then straight into coloring pages as the cats join you where you are at, your home. The cat begins by showing the "reader" favorite spots in Paris such as the Eiffel Tower and a favorite bookshop. "Cats in Paris" is filled with a great collection of coloring pages as some are scenic, some are just cats and some are cats in everyday life such as lounging on a couch or chair, laying with leaves floating down and playing with balls of yarn. My Paris loving seven year old daughter shrieked with excitement when she saw this and said that it is filled with two of her favorite things, Paris and cats. So, I would highly recommend this coloring book for anyone, of any age, whom has a love for cats and/or Paris! For more information about this coloring book, go here! To read about the author, go here! This is one of my all time favorite novella collections! Seriously, you could not ask for a better collection of historical romance novellas! Each of these women are incredible authors and you will find yourself laughing out loud, cringing at times and cheering for the main characters! Each of the main characters find themselves in a situation where ultimately a proposal is going to happen, whether it is being hoped for or not because hey we all know you sometimes find love when you least expect it and are most definitely not looking for it! Although I enjoyed all four novellas in this collection, the one by Mary Connealy is my absolute favorite. I loved how she tied together two of her series together and took the reader back to Broken Wheel with the Regulators. It was great seeing how the men and their wives and kids are all doing and how the families have grown and also how the town is flourishing. Of course, it was impossible to not be immediately drawn into the story as it begins with Carrie and Isaac escaping from their lavish home in the middle of the night and trying to remain undetected and that is when they run smack dab into Big John. I highly recommend this book to historical romance fans, but this is a can't miss read for those whom have read books and series by these authors as there are many connections! 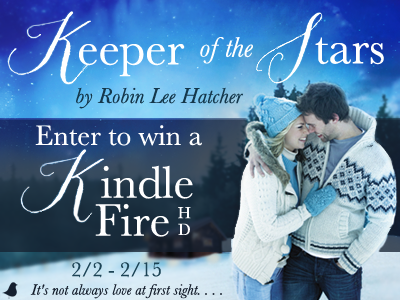 New book from Robin Lee Hatcher! Because it's not always love at first sight! When her mother died from pneumonia, Penny Cartwright was heartbroken. But now, after burying her younger brother just 12 years later, she is devastated. Anger, guilt, and sorrow cloud Penny's mind, and the last thing she wants is to be reminded of her pain---but that's exactly what happens when a stranger comes to town. Trevor Reynolds has been chasing fame for more than a dozen years, but his musical career can't get off the ground. While on the road, an accident kills his young drummer, Brad Cartwright. Trevor wasn't behind the wheel, but he still blames himself . . . and so does Brad's sister, Penny. Now Trevor finds himself in Kings Meadow, determined to follow through on his final promise to his friend. Still feeling the pain of Brad's death, Penny and Trevor must learn that forgiveness is the only thing that can heal their hearts. And if they do forgive, something beautiful may rise from the ashes of heartbreak. Best-selling novelist Robin Lee Hatcher is known for her heart-warming and emotionally charged stories of faith, courage, and love. The winner of the Christy Award for Excellence in Christian Fiction, the RITA Award for Best Inspirational Romance, two RT Career Achievement Awards, and the RWA Lifetime Achievement Award, Robin is the author of over sixty novels. 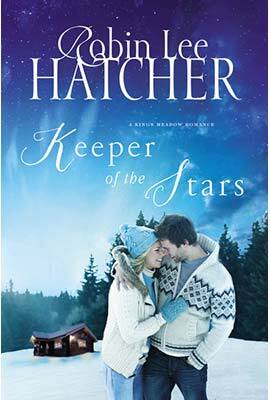 I have enjoyed the King's Meadow series by Robin Lee Hatcher and "A Keeper of the Stars" is a wonderful addition to this series. Penny and Trevor were both characters whom I loved and loved how much growth and strength developed in them throughout the book. Penny was filled with so much hurt and anger and justifiably so; however she is forced to deal with that when Trevor arrives. Trevor has so much guilt even though he is not to blame and he has to work through that while trying to fulfill the promise that he made. Robin does an incredible job with developing the characters and the storyline with typing in hope, forgiveness and love. Also, I have to mention how gorgeous the cover is on this book, simply beautiful. I highly recommend this book and series. "Raising Uncommon Kids: 12 Biblical traits you need to raise selfless kids," by Sami Cone, is an incredible parenting book to read and learn from! This book is divided into 3 sections with 4 traits being focused on in each of the sections. The first section focuses on one's heart at home, specially love, harmony, gentleness and bearing with. These traits focus on one's relationship with God, and relationships and interactions within the family unit. The second section focuses on one's attitude toward others, including the traits of kindness and forgiveness. The third and last section deals with one's influence in the world with focusing on traits such as gratitude and compassion. I love how the book is set up as there is a chapter devoted to each characteristic. The author really shares her heart, and her triumphs and mistakes that she personally has learned from. The overall attitude of this book is so positive and uplifting as the purpose is to create and instill positive behaviors and attitudes instead of focusing on the negative ones that need eliminating. As the positive attitude and behaviors are established and built upon then the negative ones will automatically decrease. This book was eye-opening to me as it really forced me to think about what I am modeling to my children and really everyone who I come into contact with. I highly recommend this book as a must-read for parents. Have you ever thought: If I just had a little more money I would be happy? Research has shown this belief to be false. Through personal experience, Biblical passages and timely research, coauthors Brad Hewitt, CEO of Thrivent Financial, and Dr. Jim Moline, consulting psychologist, reveal that financial happiness and security have little to do with how much money you have, and a lot to do with the role money plays in your life. Your New Money Mindset isn't just another book about managing finances. It's a book about reshaping your relationship with money by examining your attitudes and beliefs around money. -Defies the consumerism that infects our culture and sickens our hearts. -Shows us how to replace the tension and fear we feel about money with contentment and peace. -Guides us to live open-heartedly with our time, energy and money. -Provides an online New Money Mindset Assessment™, which will help you pinpoint what attitudes about money you could work on in order to develop an openhearted attitude to life. Regardless of your financial situation, we invite you to journey with us to discover how to transform your relationship with money by remaking your heart. Brad Hewitt is president and CEO of Thrivent Financial, a not-for-profit Fortune 500 organization dedicated to helping Christians be wise with money and live generously. He speaks regularly on how a redefined relationship with money can help us find and live out our call in life. He and his wife live in Minnesota. 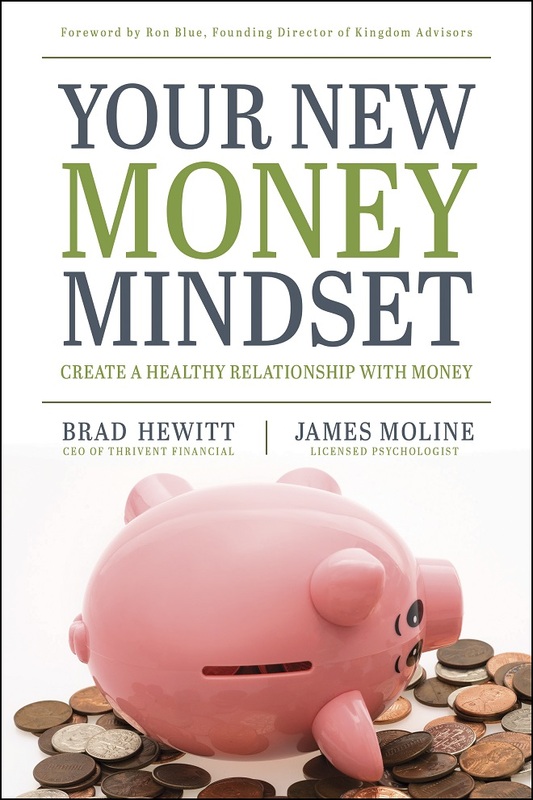 "Your New Money Mindset: create a healthy relationship with money," by Brad Hewitt and James Moline, takes a fresh approach to discussing money. These men really dive into one's mindset and attitude as the title states, which can often be an overlooked aspect of one's approach toward money and managing it. These authors make a great team as one is the CEO of Thrivent Financial and the other is a licensed psychologist; therefore they each bring his own strengths and expertise to the book. Each of us has our own money relationship, good or bad we have one as it is our attitude and just in general thoughts and feelings toward money, toward budgeting, paying bills, and this can be anxiety-producing or just seen as a part of everyday life. This book really will help you to really discover what your money relationship is and help tweak it so it is overall more positive and helping you accept it as a part of life and not something that causes worry and negative attitudes as we may long for more than we have and can afford and struggle with not having enough money to live our current lifestyle. I highly recommend this to everyone as it will help you to become more aware of your thoughts toward money and managing money and even if you feel you are doing well in this area it can only strengthen you.
" "Paris Street Style" is an awesome coloring book! It is black and gold with thick pages and also an elastic band holding the book closed, it is a very visually appealing book. Although this is marketed as an adult coloring book, my 7 year-old daughter claimed this as soon as it arrived! She has a fascination with Paris and stated she HAD to have this and immediately began to page through the book and then began coloring. There is a great variety of coloring pages in the book and the pages have varying amounts of images on them. This would definitely be at the top of my list as a coloring book to not only have for myself, but for any other girl or female whom would enjoy coloring as it is a beautiful book and would make a wonderful gift for hours of relaxation and enjoyment. To find out more information about this book, go here! 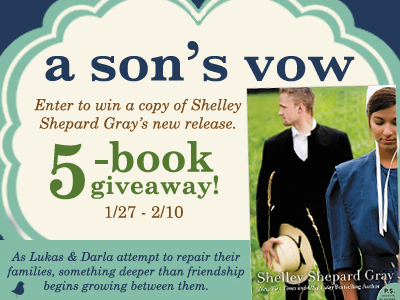 A new series from Shelley Shepard Gray! Go here for a chance to win! : Giveaway! Three months ago, everything changed for Darla Kurtz and her family. Darla's father was responsible for a terrible fire at Charm's lumber mill which killed five Amish men. And though he, too, lost his life, the town of Charm hasn't looked at her family the same since. Even Lukas Kinsinger---with whom Darla used to have a close friendship. Now her brother's anger at the town is spilling over onto Darla, and she has the bruises to prove it. The accident already cost five lives, but if something doesn't change soon, Darla fears it will cost her---and her family---even more. Lukas Kinsinger wants to mourn the loss of his father, but he can hardly find the time to breathe. Suddenly the head of his father's lumber mill and responsible for taking care of his three siblings, he's feeling the pressure. He has also never felt more alone---especially with the new tension between he and Darla. But when he learns of her troubles at home, Lukas knows he can't simply stand by and watch. Someone has to help her before another tragedy occurs. As Lukas and Darla attempt to repair their families, they discover something deeper than friendship growing between them. But will Lukas and Darla's love be accepted after so much loss? Or will the pain of the past overcome any chance of future happiness? Shelley Shepard Gray's first book in her Charmed Amish Life series is set in the quaint Amish village of Charm, Ohio, and tells the stories of the Kinsinger siblings who are each struggling to find both forgiveness and love in the face of tragedy. Shelley Shepard Gray is a New York Times and USA Today bestselling author, a finalist for the American Christian Fiction Writers prestigious Carol Award, and a two-time HOLT Medallion winner. She lives in southern Ohio, where she writes full-time, bakes too much, and can often be found walking her dachshunds on her town's bike trail. Charm, Ohio is the setting of this brand-new series and also a horrific tragedy that killed several men and left two friends trying to pick up the pieces and find their place in this town once again. 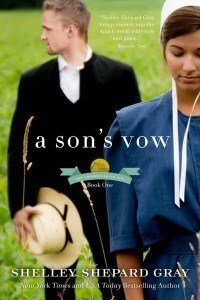 "A Son's Vow" is such a great start to this new series and I cannot wait for book #2 to be released. Darla is facing life living with the accident hanging over her head and she is struggling with how her family has been affected and her own individual life. Lukas' life has been impacted and he finds himself struggling to take over as the head of the family and the business and be strong for his siblings. This is such a fast read but it is full of emotion, tension and drama all set in a cute town that became so real as did the characters. This is a must-read for those whom enjoy Amish fiction. "Lucky Peach" is a huge collection of Asian recipes that are all together in a beautiful hardcover edition with colorful pictures of each dish. There are breakfast recipes, sauces, rice dishes, seafood, pancakes and soups just to name a few of the recipe sections. I love Chinese food and I am excited to try many of these recipes. Although some of these included in here I have never heard of, they sound great and I am happy there are pictures to go along with the recipes as I love to see what my cooking should look like! :) Another feature I like about this book is the little tips that are included at the end of the recipes that give a personalized feel. for more information about this book, go here!